Borg attributes their success to the detailed event reports offered by the MiX solution’s reporting suite, used in conjunction with MiX Vision footage to identify and correct driver behavior. Based in New South Wales, Australia, Borg Manufacturing is a leading manufacturer of decorative wood panel surfaces and made-to-order kitchen cabinet doors and benchtops. Despite being an extremely successful operation, Borg was aware of a high rate of unsafe driving and vehicle rollovers – especially in deliveries that took vehicles over hills and through forests. Airco, a MiX Telematics channel partner based in Sydney, recommended MiX Fleet Manager, a fully integrated fleet management solution that would help to meet the company’s safety, efficiency and compliance needs. By combining an in-vehicle monitoring system (IVMS) with MiX Vision, MiX’s in-cab video offering, Borg Manufacturing could immediately start monitoring driver behavior, driving hours and vehicle performance in a bid to improve their business outcomes. Implementation began in February 2015 and, by March, the system had already started showing a return on investment. 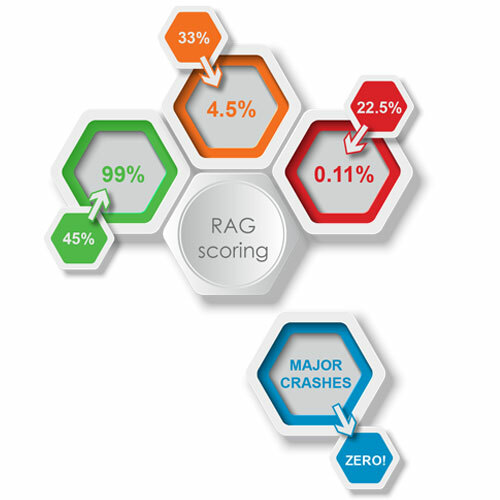 In terms of RAG scoring, green (safe) scores went from 45% of total km driven to 99% in just six months. Red (unsafe) scores dropped from 22.49% to 0.11% in just seven months, and amber scores dropped from 33.01% to 4.52% over a total reporting period of 16 months. The company also set up geo-fences in areas where rollovers had happened on a regular basis and dropped speed limits in those areas from 60 km/h to 50 km/h. Drivers had no choice but to slow down, with the result being a 100% reduction in rollovers. Our crash rates and associated repair and maintenance costs have dropped considerably, ensuring a safer workplace.